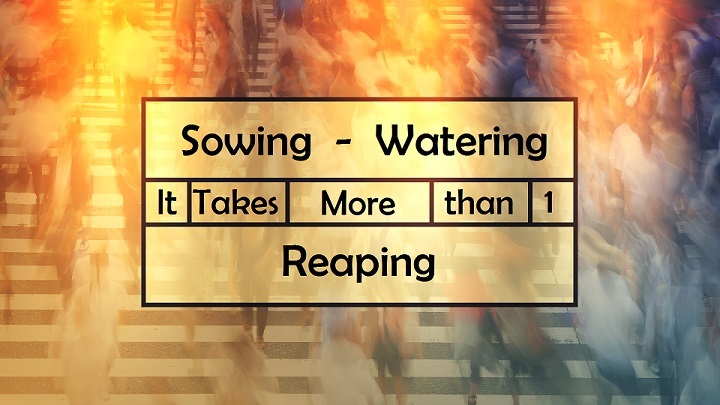 Sowing • Watering • Reaping: It Takes More than One! The Greatest Words This Daddy Could Hear! It’s been along few weeks with work, ministry and family. I was tried. It was a Monday night shortly after 10:30 pm and I was ready for bed. The girls were still up watching TV due to the fact that its summer break. I had given the girls their good night hugs and kisses and told them that I loved them then I crawled into bed. I was just about to close my eyes when I heard my oldest daughter, Caitlyn, say, “Daddy” as she walked into our bedroom. Honestly, I wasn’t happy about this interruption. I wanted to tell her that whatever she wanted it could wait till tomorrow since I had to get up early for work. However, I didn’t. I rolled over and said to her: “What is it baby girl?” That is when I heard Caitlyn say: “I want to become a Christian.” I sat up immediately and said: “You do?” to which she replied “yes sir.” So we sat on the bed and talked about what it meant for her to become a Christian. After sharing the Gospel of Jesus Christ for about 20 minutes with Caitlyn, I asked her to tell me once again what we talked about. I wanted to make sure she understood the decision she was about to make because it is the most important decision in her life! That’s when my beautiful wife, Holly, looked at me and said: “Jacob, she gets it.” See, over the past 8 years I have learned to listen to my wife in times like these. Holly has a very discerning spirit about her. I told Caitlyn what she needed to pray and that I would help guide her through her prayer. So with that, my sweet little baby girl took her momma’s hand and one of mine while Holly and I held Megan’s (Caitlyn’s 4 year old sister) hands as she bowed her little head and prayed. Caitlyn confessed with her mouth that Jesus is Lord, she believed in her heart that God raised Jesus from the dead (Romans 10:9) and asked Christ to forgive her of her sins so that she could be cleansed of all unrighteousness (1 John 1:9). When she prayed these things, according to Scripture, she was SAVED! It was such a joyous time and we all had tears in our eyes! I didn’t care how late it had gotten. It could have been 2 AM and I would have been wide awake, my baby girl had just became a child of the Living God! I could not have been more proud of Caity Grace for making Jesus her Lord and Savior! It was a very special moment in this daddy’s life! One that I have been praying about for 7 years and 2 days! What a blessing for this daddy! Unfortunately, not every daddy has the opportunity of leading their child to the Lord. I consider myself very lucky to have shared in this special time with Caitlyn. However, I am not the only player in her story. While I had the opportunity to lead her to Christ, I know that I am not the one who saved her. The Lord God is the one who saved her because our Heavenly Father is the Lord of the Harvest (Luke 10:2). The Scripture also talks about different people who sow, water and reap the seed of the Gospel (1 Cor. 3:6&7). Just as the Scripture says, there are many people that played a part of Caitlyn’s salvation story that have sown and watered the seed of the gospel in her life! Her salvation story has been over several seasons of her life. For example, Monday night was not first time that Caitlyn has come to us about becoming a Christian. She has come to us a couple of times over the past year and we talked to her about salvation but we didn’t feel she was completely ready to make this kind of decision. So we would tell her that we would talk about it later and she never brought it back up. We didn’t want to push the issue with her. Holly and I wanted it to be in God’s timing. However, during those times, Holly and I were watering the seeds that we planted long ago. We started telling both our girls about what Jesus did for us on the Cross when they were both really young. So they have heard the Gospel from within our home. Then with me being a pastor, and church is not an option for them, they have also heard it at church. They hear the gospel being taught from their teachers in their Sunday school class and in Little Lambs. There has been all of those who have taught the different VBS’s over the years, they are a part of her story too. Many of our friends and family members have shared Christ’s love with Caitlyn over the past 7 years. They all have played a part in her story! All of them will be rewarded in heaven one day! Remember, God uses more than one person to fulfill someone’s salvation story! Just rejoice when you are a part of someone’s story! I want to just thank each of those who have had a part in Caitlyn’s salvation story!! I want to give a special thanks to two very special people: Caity’s Grammy (Joannie Phelps) for always sharing Christ’s love with her and her Granny (my Grandma) for always praying for this day! I know there are more people who have shared Christ love with Caitlyn and I don’t want to miss any of you! However, Christ knows who has been a part of Caitlyn’s salvation story and I am eternally grateful for each one of you. The one that I am most thankful for is my Heavenly Father who made it possible for us be redeemed by the Blood of Jesus Christ through the death and resurrection of our Lord and Savior Jesus Christ! I would love to hear your story! If you are a believer in Christ Jesus, how did you come to know Him as your Savior? Thanks YB! God is so amazing and very faithful! Thanks YB! I am truly grateful for my dad showing me how to love my family!